Introduction - this is usually a small summary of the club's last activities or just a small article on an iteresting item, article, or other philatelic item from last month. eBay Watch - we highlight an item that sold within the last 30 days, usually the most expensive US stamp. Calender of events - a calender of our clubs meetings with a listing of presentations, auctions, or activity is being held for that meeting. We also list any trips, events, or presentations we have scheduled for the club here with the person to contact if interested in going or helping. New Members - an announcement of any new members we have. Meeting Minutes - Written by the secretary, the minutes of the meetings of the past month. Club News & Trips - This is mainly a section going over the past month's events in detail and any news we may have. Everything's Stamps Club Notes - An article including the minutes and any news for the youth stamp club at the Abington Community Library. Guest Article - Each month we have a philatelic article that is either written by a club member or from another philatelic source. 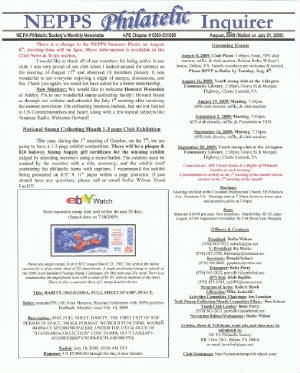 Want Ads - Ads placed by our members for philatelic items they are looking for. Activity - A monthly activity for the youth club to complete, some are even interesting enough for our adult members. If you want to request a copy of our newsletter, please fill out the form below. A current issue will then be sent to you.